Or so it would seem. 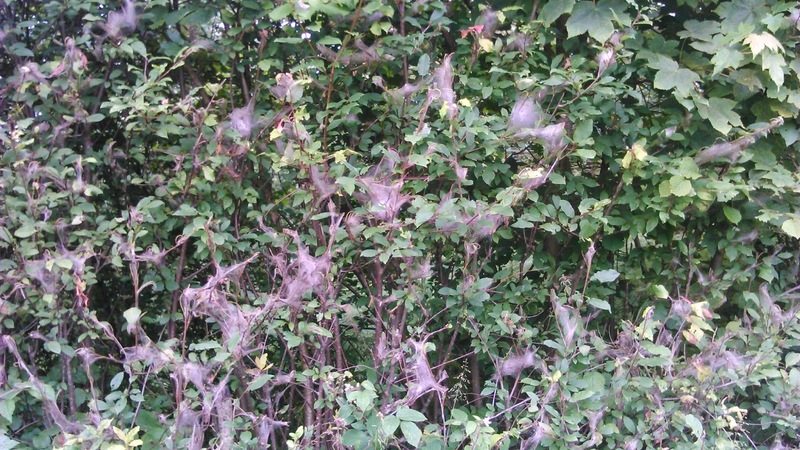 On your travels out and about, you may have noticed some of our hedgerows covered in strange cobwebs. 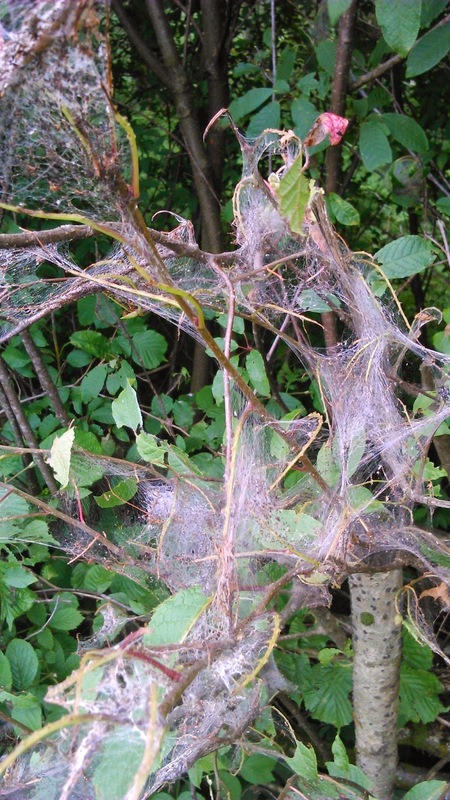 It appears that rather like our supermarkets bringing out the Easter eggs and Christmas cards 6 months early, that someone or something has been decorating our hedgerows with some spooky webs ready to celebrate all-hallows eve! But what is encasing trees and hedges in webs and stripping them bare of all their leaves? The creature in question is the ermine moth. From my research and speaking to other much more knowledgeable rangers, it seems that this is a fairly natural phenomenon. 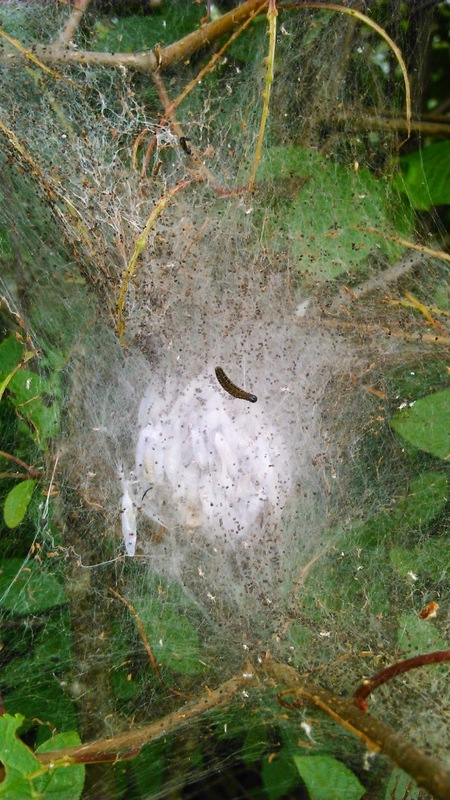 The ermine moth caterpillars live on host plants (the specific plant depends on which type of ermine moth it is), working together to cover the plant in cobwebs to protect them from parasitic wasps and birds for anything up to 6 weeks, feeding off the leaves underneath. When their delicacy runs out, the caterpillars simply move onto another host plant, devouring the leaves until they are ready to ‘hatch’ into the beautiful ermine moth. Yet despite this destruction, the tree or shrub will recover growing new leaves in that season! The ermine moths will lay their eggs in the host plant a few weeks after pupating, where the caterpillars will over-winter ready to eat the new growth in the spring. 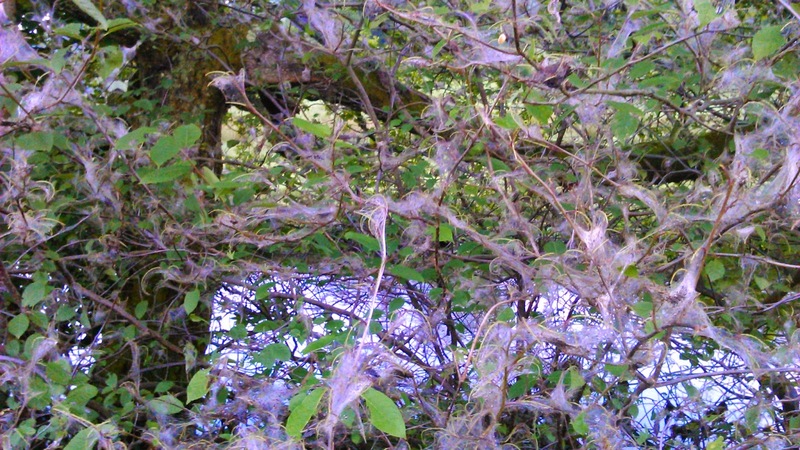 So despite the webs looking rather destructive and sometimes sinister, it is not in the interests of the ermine moth to kill of its host plant. The ermine moth is certainly hungry this year! The moth usually is small, whitish and long with rows of black dots on its wings depending on the variety. As you can see, it is one of the prettier moths we have in the British Isles. The moths form an important part of the ecosystem, being an excellent food source for many predators and act as excellent pollinators too. Most moths are harmless and even beneficial. Some, like this particular moth, look rather more like a pest. A quick google search brought up lots of examples of cars, bikes and whole rows of parkland trees that have been decimated by the ermine moth larvae or even something else entirely! The ermine moth is usually active in July and August so there is still plenty of time to get out and look in our hedgerows for this almost freaky act of nature. Some of the best examples of devoured hedgerows in the South Lakes I have found tend to be along road edges such as up and over Hawkshead Hill but also river courses such as along Great Langdale Beck towards Elterwater and along some of our footpaths such as the ones around Blelham Tarn. Hedgerows that were planted by the National Trust rangers and volunteers 10+ years ago are acting as host plants to the ermine moth caterpillar. It is a great feeling to see the benefits to wildlife from our conservation work. It is hard to believe that the hedgerow plants will recover! 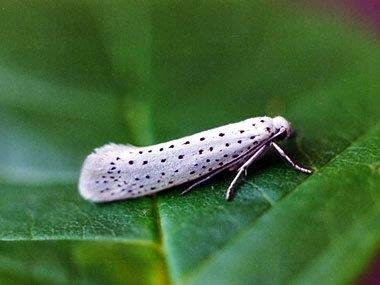 It isn’t hard to see why this moth is sometimes considered a pest. Some say it is more prolific this year, which could be due to our warming climate or just an unseasonable warm and sunny spring. Keep an eye out to see what happens in the years to come…. Maybe we won’t notice them so much next year! 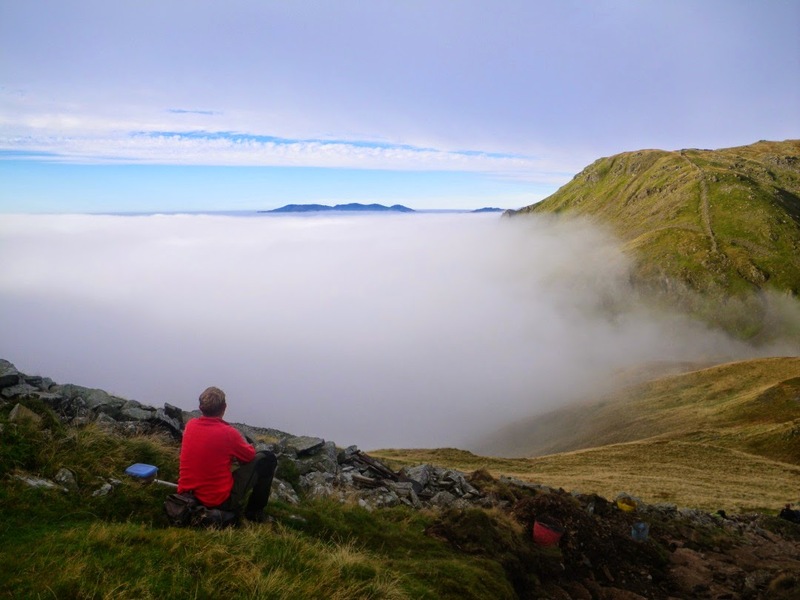 This being the Lake District, the weather has a big influence on our days’ work in the fells. The perfect day for working is a dry day with a breeze to keep us cool and keep the midges away. It doesn’t always work out like this though and we’re glad of it. We’ve had days where there have been cloud inversions. This is when all the valleys are full of cloud and the fell summits are clear. All you can see is the highest peaks just poking out from a sea of cloud. This usually happens towards the back end of our season on the high fells, around the autumn time. On days like these we’ve had fleeting glimpses of Brocken Spectres. These occur when the sun is behind you and your shadow is cast on to the cloud below with a circular rainbow around it. They have an eerie feel to them and it can look like someone is walking on the cloud next to you. 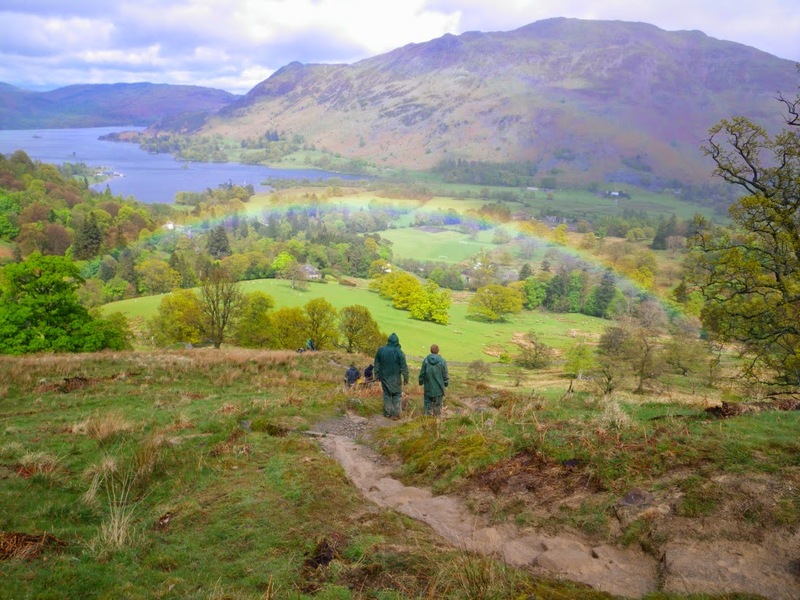 Fortunately, we’ve had very brief glimpses of these Spectres but unfortunately, not enough time to get the camera out so below is a picture of a rainbow over one of our work sites in Ullswater instead. More often than not though it’s usually the other way round and we’re working in the cloud. Whilst not getting good views, it does become atmospheric. 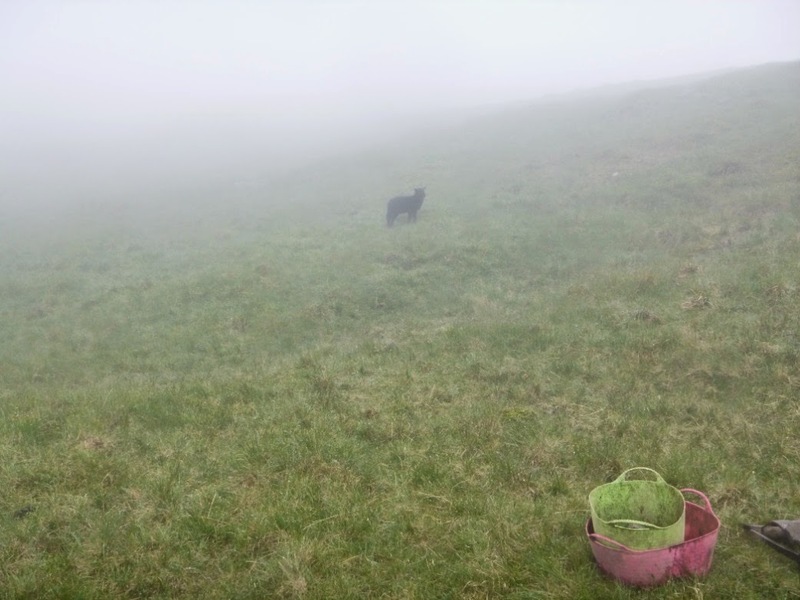 Visibility can be reduced to as little 10 Metres and when the little Herdwick lambs pass our work site you can maybe see where some of the Big Cat sightings might come from. 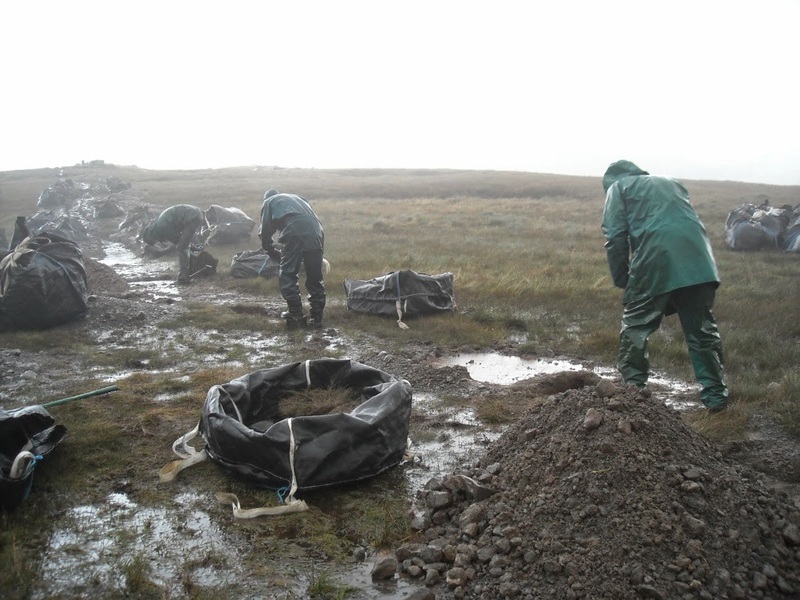 Rain plays a crucial role in our work. There are three main factors that contribute to path erosion in the fells. People, steepness of slope and water. If you have all three of these in large amounts then it can cause problems on the landscape. 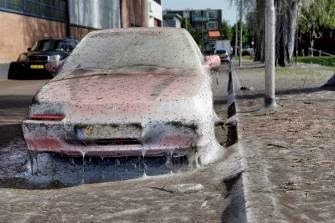 If you reduce even just one of these factors then the chance of large scale erosion is reduced. This is why we always look at drainage on the fell paths. The best days to do this are on rainy days and that’s why we’ll be out on even the rainiest days of the year. We’ve found that the weather can vary greatly from valley to valley. Our current work site is a good example of this. 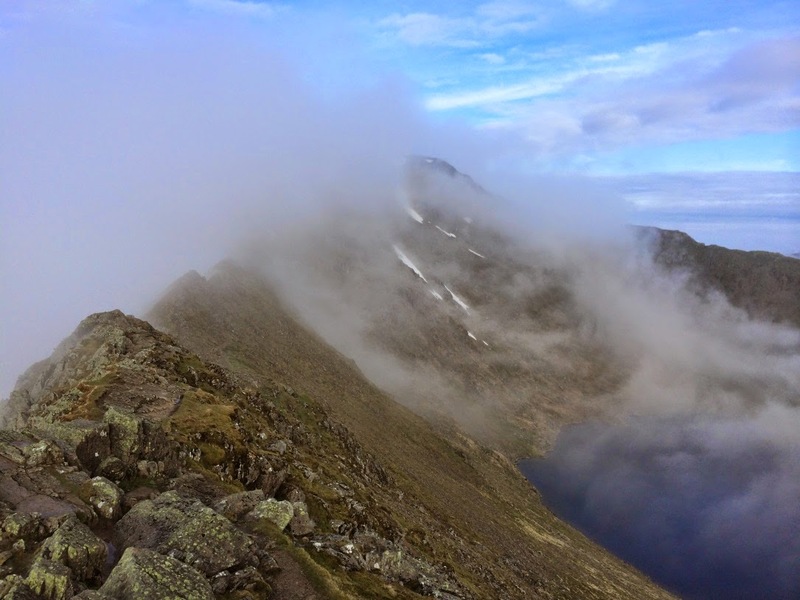 One side of Striding Edge can be clear and the other side in cloud all day. Come rain or shine, the Lakes is a special place to work in. Achieving a Childhood Dream (spoiler alert – this blog is really cheesy). I don’t really like how outdoor magazines and travel sections are full of ‘bucket lists’ and ‘must dos’. It feels like I’m being told what to like – and normally what to pay for – rather than following my own interests; and all these amazing adventures can become bullet points to tick off rather than experiences to savour. All my favourite times, in the Lakes and beyond, have been when I’ve explored something personal to me – whether it’s walking, everything I look at from my window (or tent door), tracking down the source of my local beck, or exploring locations from my favourite books. I want to get beyond the ‘nice’ view and understand what’s going on: where the dippers live, where the most characterful old trees are, how it’s been farmed, what these places meant – and mean - to other people, and what they mean to me. But, speaking of books, I did make a childhood dream come true recently, and it’s one that must be on a lot of peoples’ ‘bucket lists’ (ugh). Peel Island on Coniston Water is famous as the inspiration for Wildcat Island in Arthur Ransome’s Swallows and Amazons books, and it’s a place that’s had a firm hold on my imagination since I read the series over and over again at primary school. Looking back, I’ve no idea why I’d never visited before, either with my family or as an adult – it was only a couple of hours from home in south Manchester, where a week’s summer holiday sailing club on the urban reservoir at Gorton was the closest I ever came to my dreams of joining the crew. Somehow, even though I came camping and walking in the Lakes, the island still seemed like a place from another world, as if I never really believed that it was something you could actually make a plan to go and see. So it was with some excitement that I realised Peel Island was in the Coniston patch when I started working here a few months ago. On my first day I gazed across at it from the incredible oak woods on the east shore – home to the charcoal burners that the Swallows befriend – and tried to play it cool in front of my new boss. And I didn’t want to fabricate a reason to visit, so it was only recently that I managed to make the trip, when we actually had some work to do there. But it was worth the wait! The stars aligned, and a cloudless sky and the freshly green trees on the shore reflected perfectly in the absolutely still lake – it was impossibly beautiful to be out on the water, which added to the surreal air of the whole trip. Dunlins bickered on the rocks, oblivious to us paddling gently by and affording us a closer view than we’d ever get on land. In the bow, the Ship’s Boy (intern Paul) and Ship’s Dog were on the lookout for rocks underwater, and despite a lack of diligence of which Roger would have been ashamed, we made it into the secret harbour. Things got increasingly surreal as we explored and the harbour, the camping spot and the swimming beach all appeared as if lifted from the pages of the books and built to order, theme-park style, and all bathed in crystalline early morning light. I’m trying really hard not to sound cheesy or resort to cliché, but the simple facts are that it really was a little childhood dream come true, and that, for once, the reality really was as good as the idea I’d held in my imagination for so long. It was incredibly exciting, and to be honest, quite moving to connect my life now, workingon a patch which includes Peel Island, with the ten year old book-worm sat day-dreaming on the concrete slipway of Gorton Water Park. But y’know, with my level ranger head on I should also add that I did find the time to notice that the woodland on the island provides a fascinating example of the ecological processes of the Atlantic upland oakwoods when not exposed to grazing pressure from livestock or deer, and we did have work to do. Amongst other things, we had to simply make sure that the island was both safe and tidy, as lots of people do make the pilgrimage by canoe or sailboat. It was really heart-warming to find that it was fairly litter-free – contrary to our expectations, sadly. So thanks to everyone who takes rubbish away from this special place. I re-read the first couple of Ransome’s books following our trip, and although lots of the adult criticisms became newly apparent to me – they are irritatingly upper-middle class and exclusive – the fact that those reservations didn’t matter to me as a suburban oik of a child says it all. They’re fantastic, engaging books that inspire a love of the outdoors and a thirst for adventure, and I owe them a lot. And although my instinct is to be wary of pre-prepared bucket lists and the experiences which we’re told are ‘must do’ – which Peel Island is for any Ransome fan – sometimes, when it means something to you, a must do experience can be truly meaningful and memorable. Normal cynical service resumes next time.